ItemF-08528 - Group of the Enterprise Excursion Party. 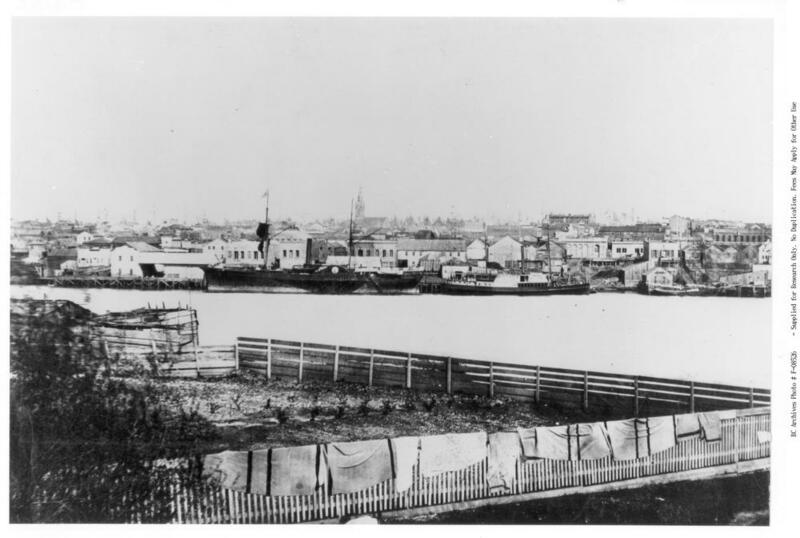 Sept. 1866. ItemMS-3100.9.22 - H.M.S. "Sutlej". "Mohawk". ItemF-08526 - Victoria. V.I. [Vancouver Island] (left side). ItemMS-3100.9.37 - Tenass [Tenas] Lake B.C. ItemMS-3100.9.40c - Skomiax. Chief of the Songish. Item F-08526 - Victoria. V.I. [Vancouver Island] (left side). MS-3100, Album 9, Page 30. One half of a panorama, taken from the Songhees. Also shows a portion of the Songhees reserve. See HP094644 for the other half.